Question - In a controlled corporate environment with DLP solutions monitoring the HTTP and Email traffic, how would you perform data exfiltration during a Red Team Pentest ? ‘One’ of the answers would be to use social networking sites, let’s look at Facebook in this post. Data exfiltration using Facebook (FB) and the like is nothing new. There has been various instances where these networks have been used as C&C, data receivers etc..
FB allows 63,206 characters in a single post, which is quite cool. So can we use that as a receiver, i.e, post data to a FB post from a corporate environment and then retrieve it from outside?? Well, 63,206 is not a big number. What if I want to send out a bigger file? - Split the file into chunks, say 50,000 characters into each post. Finally combine all of them. Surely you don’t want to login to your personal Facebook to paste data to your wall (!). Let’s use Facebook APIs. Now, I would assume that it is not always ASCII data that we would want to send out. E.g. Zip archives, image files or anything for that reason. So what do you do? Read the file in binary mode –> Do a base-64 encoding of the binary data which gives the ascii version –> split them up as necessary and post to FB using API from inside the corporate network –> Retrieve the data from the (multiple) FB posts from outside and combine them –> do the base-64 decoding –> write the output in binary mode to file –> BINGO !! Now, one thing you can also do is to Unpublish the Page / control the viewing to which you are making the post. That way, it will ensure that only the Page owner can view the posted data. During a Red team exercise, you get access to a machine from where the data (file) needs to be pulled. Imagine that the DLP solutions would detect you from sending out data via webmail, file upload solutions and the only open ports for outside access are 80 and 443. Definitely you don’t want to risk detection on port 80. Suppose the data to be sent out is in the form of a zip file (secret.zip) on the target system that we have access to. Read the zip file (I’m using Python for the PoC) in binary mode. Retrieve the encoded data from outside the corporate network, again FB API can be used. The base for the Python scripts have been adopted from link 1 and link 2. All credits to the original work for making this simple. This also goes to demonstrate how Facebook APIs can be exploited for malicious purposes, e.g. 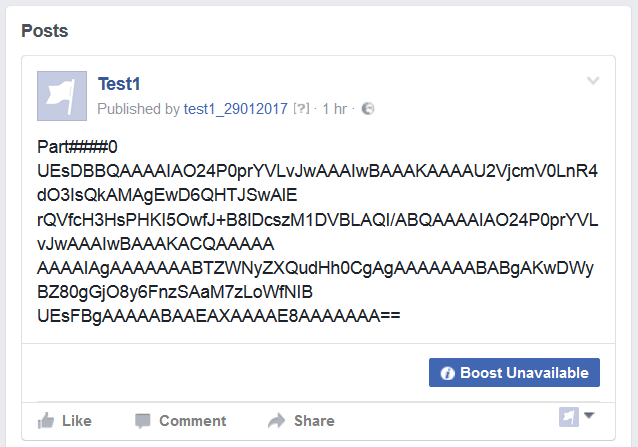 a malware with API tokens that can post to a Facebook page / wall maintained by the bad guy.